The August 5 shootings at the Sikh temple in Oak Creek, Wis., left six dead and many questions about the motives behind the tragedy. News coverage of the event has focused on why the alleged gunman targeted people at the Sikh Temple and has turned attention to the Sikh community, a religious group with a relatively small but growing population in the United States whose members are often mistakenly identified as Muslim. The Pew Forum on Religion & Public Life has collected some information on varying estimates of the U.S. Sikh population. How many Sikhs are there in the United States? Conrad Hackett, Demographer, Pew Forum on Religion & Public Life: Because the U.S. Census Bureau does not ask Americans about their religious affiliation, there is no definitive answer to this question. Estimating the size of small religious groups based on survey data is difficult, and estimates of the Sikh population vary considerably. For example, the 2012 Statistical Abstract of the United States cites an estimate of about 78,000 Sikh adults in 2008, based on the American Religious Identification Survey. 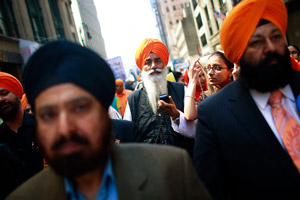 The World Religion Database at Boston University estimates there are about 280,000 Sikhs in the U.S., based on estimates of the number of Punjabi immigrants from India and Pakistan and an assumption about the proportion of them who are Sikh. The 2010 Religious Congregations & Membership Study does not include a count of individual Sikhs but finds there are 246 Sikh congregations (gurdwaras). The Sikh Coalition, an advocacy group, says there are more than 500,000 Sikh Americans but does not cite a source for that figure. The Pew Forum on Religion & Public Life’s 2012 survey of Asian Americans, which was conducted in several Asian languages as well as in English and involved interviews with more than 3,500 Asian Americans, found that about 1% of Asian American adults identify themselves as Sikhs. In addition, U.S. census figures indicate that Asian Americans make up about 5.5% of the total U.S. adult population. Combining the Asian American survey data (on Sikhs as a percentage of the U.S. Asian population) with the census data (on Asian Americans as a percentage of U.S. adults) yields an estimate that there are about 140,000 Sikh adults in the U.S. With the addition of children (based on the ratio of adults to children among Asian Americans as a whole), the estimate would rise to approximately 200,000 American Sikhs of all ages. This estimate is based on the assumption that the vast majority of Sikhs in the U.S. are of Asian origin – an assumption supported by various studies, including Princeton University’s New Immigrant Survey. However, given the difficulty of surveying both small religious groups and new immigrants, the 200,000 figure should be considered a rough estimate and more likely a floor than a ceiling.